As probably everyone expected, Activision officially confirmed today that Skylanders SWAP Force is in development for the next-gen consoles (namely the PS4 and Xbox One). This is in addition to the already announced versions for the PS3, Xbox 360, Wii, 3DS, and Wii U. Get ready to hide the wallet from the kids if you own pretty much any relatively modern console whatsoever. Release dates were also announced (October 13th for NA, October 18th for EU) as well as prices ($75 for the starter pack, $10 for the new, non-swappable Skylanders, $15 for special swappable Skylanders). We previewed the game back when it was officially announced in February, so check that out if you have any questions about the new "swap" mechanic or whether your old Skylanders will work with the new game (spoiler: they will, but you will need a new portal of power). 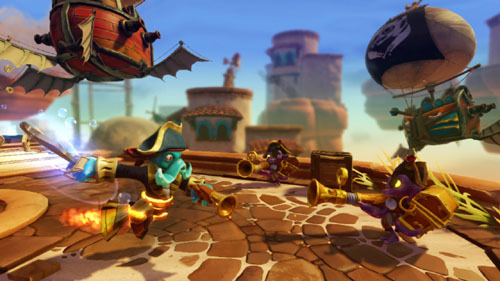 Skylanders SWAP Force will support 2-player local co-op for the Wii, Wii U, 3DS, PS3, PS4, Xbox 360, and Xbox One (jeez, that was a gauntlet of console abbreviations). It will be on display at Activision's E3 booth this week along with Call of Duty: Ghosts and Destiny. Maybe the guys attending the show (Nick, Andrew, Mike, and Locke) will get some time with it and can share their hands-on impressions.